It would be a fair assumption that, since Miller Creek crosses Miller Trunk Highway several times, the road was named for the creek and, by extension, Robert P. Miller. Not so. Miller Trunk Highway is named for Charles Goodell Miller, who arrived in Duluth in 1871, seven years after the creek’s namesake had passed. He was just 11, and his family came to the Zenith City after fleeing the destruction of their home in the Great Chicago Fire. His father, Captain John W. Miller, became Duluth’s harbormaster, and reportedly sailed around the world six times. The difficulty of travel back and forth to the Iron Range must have had a great impact on Miller. 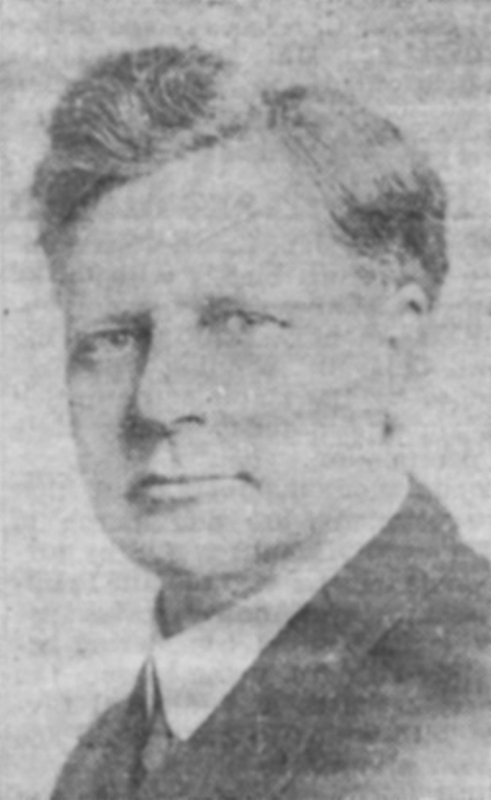 When he was elected as St. Louis County commissioner in 1892, he immediately championed the idea of a highway from Duluth to the Mesaba Range, a notion that most Duluthians opposed, primarily because of its cost. Votes from the Range swung the deal his way; however, his victory eventually cost him his seat. His subsequent runs for County Sheriff were unsuccessful, but his name was given to the new Miller Trunk Highway when it opened in 1896 and became the main route northward. At the advent of automobile travel, auto-enthusiasts filled the columns of local newspapers with frequent complaints about road conditions. In 1912, the editor/publishers of the Daily Virginian and the Eveleth News traveled to Duluth and promptly announced that the Miller Trunk Highway was “in the worst condition it has ever been.” They reported meeting another traveler on the way who had been “forced to repair eleven punctures and three blowouts” en route. The next spring, the first automobile trip of the year encountered snow drifts and a washout ten feet deep and eight feet wide. The party had to cut and make their own timber bridge to get across the gap. Though the trip took the entire afternoon (including the building of the bridge), “excellent time was made.” Another auto party complained that average speeds on the highway were about 18 miles per hour, and declared the train to be a better choice. If only the county would surface the highway with concrete, they said. Efforts toward that end began soon thereafter. However, the fight for funds was long, and just when the goal appeared within reach, World War I stopped things cold. Finally, in 1919, the County Board voted to pave and widen the Miller Trunk Highway. It would be the longest concrete road in Minnesota. When the surfacing was completed in the autumn of 1922, the celebration was jubilant. 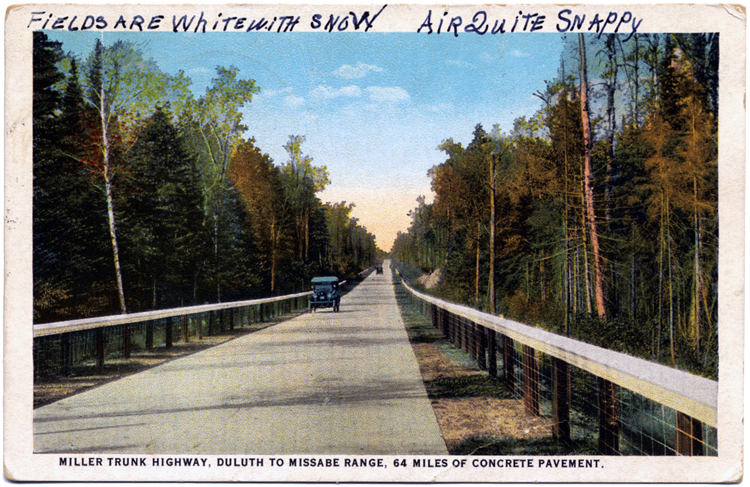 The road was called “Our Appian Way,” and October 14 was declared “Miller Trunk Highway Day.” The fete’s slogan was “Jean Duluth Meets Miss Mesaba,” and a convoy of 300–500 cars was expected to leave Duluth at noon that day for Eveleth, each bearing a sign on the windshield saying “Duluth Greets You.” The convoy entered Eveleth under a “giant welcome arch…on the order of the Arch of Triumph,” reportedly 40 feet high and 50 feet wide, built of “material built to simulate cut stone.” Suspended from its center was a large bronze medallion bearing the letters M-R-D, standing for Mesaba Range Duluth. After welcome speeches by various mayors, a brass plate was unveiled in the center of the road beneath the arch bearing the words “Miller Trunk road, State Highway No. 11, Opened Oct. 14, 1922.” This ceremony kicked off more speechifying, including the honoring of Charles G. Miller, now 62 years old, for his “energy, determination, and vision.” The rest of the day’s activities included bands, a street carnival and all-day barbecue, a football game between Duluth Central and Eveleth High School, and a grand ball in the evening.